Cross Keys Homes’ pre-apprentices are celebrating reaching their three month milestone, marking the half way point of their paid work experience. 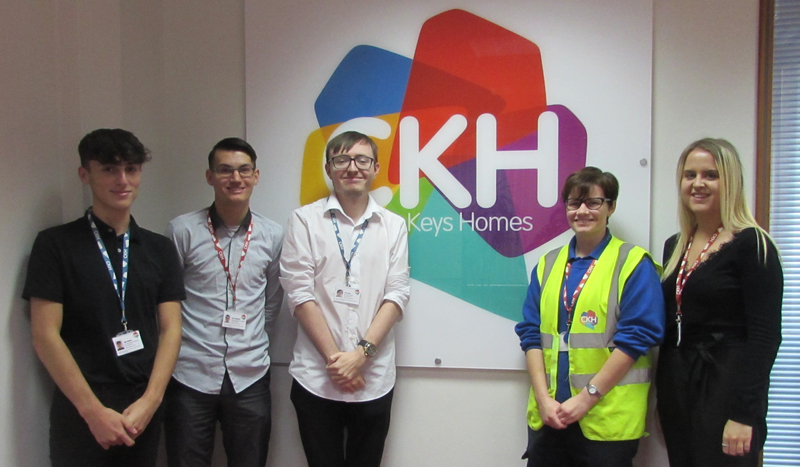 Cross Keys Homes’ (CKH) pre-apprentice scheme is a life changing opportunity for young people aged between 16 and 24 offering a six month paid work placement in various departments including Customer Services, Incomes Management and Communications. Thanks to the scheme six young people have been able to develop valuable employability skills and work experience to help them with their future career prospects. Claire Higgins, Cross Keys Homes’ Chief Executive, added: “We are very proud of our pre-apprentice scheme which is an excellent starting point for young people looking to build their careers. Our current pre-apprentices are three months into their placement and are really enjoying their time with us. One of this year’s cohort has even gone on to secure a full time apprenticeship with us already!. Over the last seven years, CKH have helped over 100 young people to start their careers, with 80% of the pre-apprentices moving on into work or back into education. If you’re interested in opportunities to join CKH’s pre-apprentice scheme in the future, visit www.crosskeyshomes.co.uk/pre-apprentices to find out more.